The NAWCA small grant funds the removal of Russian-olive trees, like the one pictured overhanging the South Fork of the Republican River in Yuma County, Colorado. Photo courtesy of Fred Raish, Yuma County Pest Control District. Applying for a North American Wetland Conservation Act (NAWCA) grant may seem daunting, but preparing a proposal for the small grant program may be easier than you think. We recently talked to Noe Marymor, from the Bird Conservancy of the Rockies, to get some tips on writing a successful proposal. She is a private lands wildlife biologist who works with the Natural Resources Conservation Service and Colorado Parks and Wildlife to deliver habitat conservation projects through Farm Bill funding sources in northeast Colorado and recently helped develop a NAWCA proposal that was awarded $75,000. The funds will help remove invasive Russian olive trees along the Republican River in Yuma and Kit Carson counties in northeastern Colorado. For first-time grant writers, understanding the background of this grant program and how it fits into the North American Waterfowl Management Plan (NAWMP) can be helpful. The plan, which seeks to increase duck population levels on the continent, recognizes that providing wetland habitat is key to sustaining waterfowl populations. 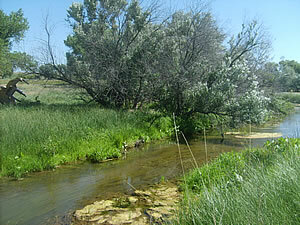 NAWCA grants, both small and large, provide funding for long-term wetlands conservation projects. Since NAWCA grants are ultimately designed to help sustain wetland bird populations, projects should be designed with that in mind and proposals tailored to fit that goal. Once you have a project idea, you’ll need to consider how to get it accomplished, which requires looking at two money issues: 1) how much the entire project will cost, and 2) how much non-federal cash and volunteer services will be contributed by the partners involved (match). When looking at match, there are several things to be aware of. Match must be from non-federal funds. Match can include funds that have already been used for the project, up to two years previously, as well as funds that will be given during the two years after you submit the proposal. Match can be either cash or volunteered services. Finding these funds from more than one partner helps your proposal. Matching funds must be equal to or more than the requested amount, with a higher matching ratio looked on more favorably. If the currently projected match is lower than half the project’s entire cost, consider dividing the project up into logical chunks and requesting funds for one portion now and for another portion when there are additional matching funds. Some grantees in the PLJV region have made requests for as little as $5,000. When the budget is determined you are off and running. The proposal itself requires only four pages of written material. This includes describing the project and partners, and answering questions about the project’s value to wetlands and wetland dependent species. PLJV can provide support with many aspects of proposal development—including discussing project ideas, directing applicants to planning information and helping to determine the value of the project to birds in the area—so we recommend having a conversation with our Conservation Delivery staff early in the process. So be sure to plan enough time to gather supporting materials and write, review, edit and submit your proposal through grants.gov. Also, remember that PLJV is here to help support your project. Please talk to us and your other partners throughout the development process. For questions on anything NAWCA related, please contact Christopher Rustay at christopher.rustay@pljv.org.